Volume I: Financial Markets and Instruments skillfully covers the general characteristics of different asset classes, derivative instruments, the markets in which financial instruments trade, and the players in those markets. It also addresses the role of financial markets in an economy, the structure and organization of financial markets, the efficiency of markets, and the determinants of asset pricing and interest rates. Incorporating timely research and in–depth analysis, the Handbook of Finance is a comprehensive 3–Volume Set that covers both established and cutting–edge theories and developments in finance and investing. 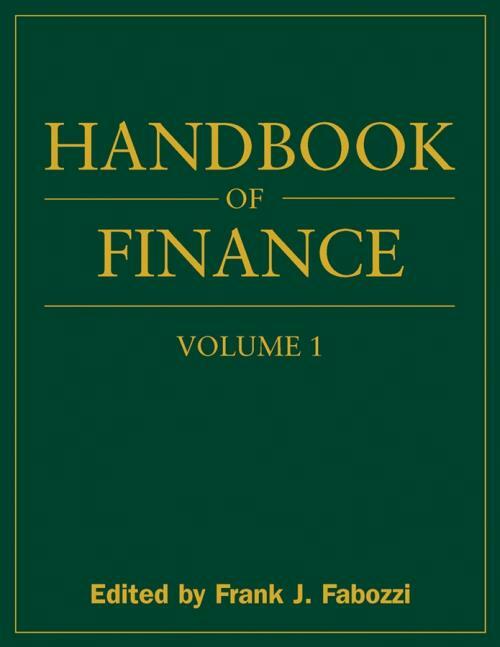 Other volumes in the set: Handbook of Finance Volume II: Investment Management and Financial Management and Handbook of Finance Volume III: Valuation, Financial Modeling, and Quantitative Tools. Guide to the Handbook of Finance. Volume I. Financial Markets And Instruments. I.1 Market Players and Markets. I.3.2 Nonmortgage Related Fixed Income Securities and Money Market Instruments. I.3.4 Fixed Income and Inflation Derivatives. I.6 Investment Companies, ETFs, and Life Insurance Products.